General Characteristics: Short to medium in height, well spreading, maturing within 9 to 12 months, producing from 5 to 10 oha; identified by the light self-green spreading petioles and sagittate leaf blades. Petiole: 55 to 70 cm. tall, light green, inconspicuously greenish at edge, white at base. Leaf blade: 35 to 50 cm. long, 25 to 35 cm. wide, 30 to 40 cm. from tip to base of sinus, sagittate, medium green; margins slightly undulate; piko yellowish; lobes acute with wide sinus. Origin, and derivation of name: Native variety; possibly named after Kalalau, a tableland on Mt. Waialeale, Kauai. 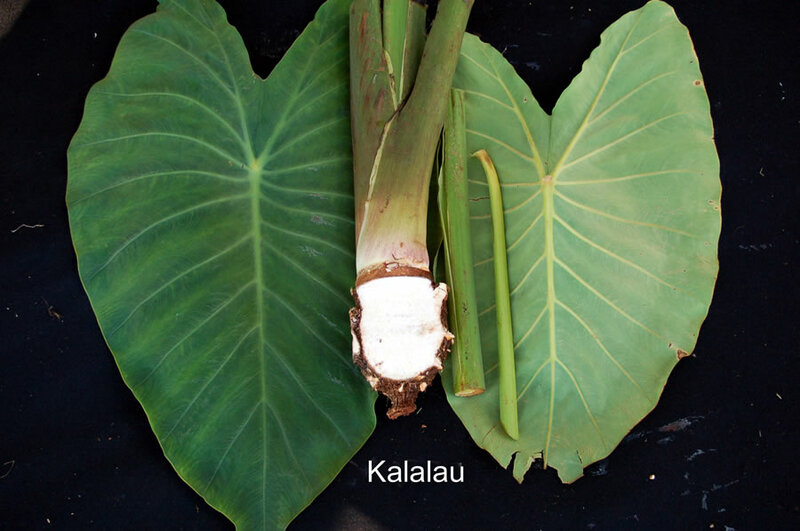 Distribution: Planted quite extensively on Maui, Molokai, and Kauai. Use: Not very important commercially as it is inclined to rot readily under slightly adverse conditions. The luau is relatively nonacrid. Poi of good quality may be made from this variety.